The GyroDrive is based on a gyroplane - a mini-helicopter - that uses a copter-style rotor to move up and down, and an aeroplane-type 'pusher propeller' to go forward. We have been driving cars for the last trillion years or so. Wow! Has it been that long? Literary NO…but technically, it feels like we have been doing so since the existence of dinosaurs. And why does it feel that way? Because the story has remained the same over and over. We drive a certain model for a number of years, dispose it, get a better model, but still do the same thing we did with our former car. What if there was a way to add a thrill to the next car model we acquired? What if we could drive and say, fly in our car? Yes, fly a car! Ourselves! This would totally change what we currently refer to as Car Driving. That 50K you thought you would spend on another car model would bring you more value if invested on a GyroDrive. According to Czech Pilot Pavel Brezina, the GyroDrive is the first two-person mini helicopter granted a DRIVE and FLY license. It is based on a gyroplane that utilizes rotors to ascend and descend copter-style and a pusher propeller to move forward in an aero plane-fashion. It needs less than 328 feet (100 meters) of runway to rise above the ground and go up…up into the sky. Nirvana Systems, Mr. Brezina’s company, procures gyroplane kits from a firm based in Germany. Transformation is based on a series of assembly processes that equip the gyroplanes with a system that allows pilot-drivers to shift from a gasoline engine to electric engine and back. The finished Nirvana product is a car that has a gasoline engine that propels its rotors and an electric system that drives power into the wheels. The features of this car enable it to reach a maximum speed of just 25 mph (40 kph). The flying range is a cool 372 miles (600 km) at around 118 mph (180 kph). 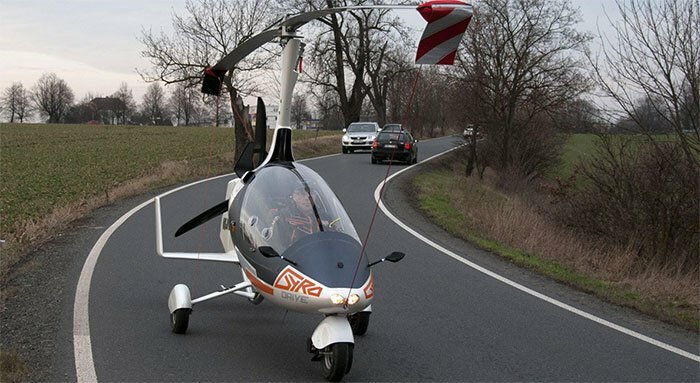 To transform the GyroDrive into a road car after landing, the pilot adjusts the rotating blades along the axis of its body and pulls out a built-in license plate. A set of certain qualities are required. It isn’t just pushing a button and setting to conquering the skies. Worldwide, inventors are hysterically working on car prototypes that can fly. These prototypes may have different features, but all are aimed at taking driving to the next level at varying cost. Brezina is pricing the GyroDrive from 1.5m koruna (£50,000), but depending on specification this can increase to 4m koruna. Competition in terms of practicality and safety is high and we are all observing which model rises above all others. I live in Australia, whereas this has been developed in Europe. Will this be legal to drive/fly here in Australia? I often go on long trips and if I can fly to my destination and avoid much of the traffic then this would be brilliant. Is it legal in the U.S. What’s the cost? I have a business, and this would be very helpful to me when I need to get to my customers. And availability in Chicago Illinois area. It’s not the first flying car a company called Terrafugia has had one for a while. It’s called the Transition. It’s a plane with folding wings that fits in an average garage. This would be great when I’m on call for Labor and Delivery! 25 MPH isn’t much use, Is that correct? ?